I always had a bike when I was growing up. I was taught by Mom and Dad that when we were through with them, put them away. Usually that meant open the garage door, roll it in and squeeze the bike into a hole in the "treasures" that were stored in there. The garage was a treasure trove of trash and old things we couldn't bear to get rid of. Things put there when I was a toddler were still in there when we moved out of the house when I was in college, never touched. It was safe. Even when the house got broken into, the garage was untouched because it was too much of a mess. I never conceived of having to do anything more to keep anything safe. 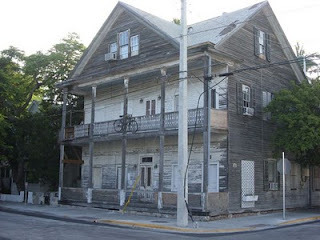 Every time I pass by this building in Key West I'm stopped by it. The place needs a coat of paint or three. It has some serious weather damage and wood that needs to be replaced. I'm sure if it ever got looked at it "wouldn't be up to code". Knowing Sgt Gary Blocker, and Kim on Code Enforcement here in Wilton Manors, I'm sure of it. That doesn't mean that the building is unsafe although it may. It has been there through countless Hurricanes, Tropical Storms, Thunderstorms and invasions of snowbirds and it still stands. It looks like it is still inhabited although you can't prove it by me. One other thought. That bike. There's a bike on the second floor balcony that is chained up on the outside of the railing and it has been there for at least five years. It may be moved off the balcony and used to "go home" at the end of a work day. My own personal fantasy is that the building is a secret art studio where the next century's treasures of the Louvre Museum are being created and the artist is watching everyone watch his house for inspiration as they scratch their heads about how bikes grow on trees ... or balconies. I've been told that Key West is a fairly safe place in most areas during the day in Old Town where this place is. Just don't leave anything out that isn't tied down. The folks on the job in Police Work call it "Opportunistic Crime". Bikes are a prime target anywhere, most folks don't have a safe and cluttered garage in a place as congested as Key West to hide their treasure trove. I've been told that if I don't have a lock on a bike in Key West, don't stop anywhere. I don't know if it is quite that bad, but it does lend itself toward individualistic and quirky solutions. Like planting a bike on a building. I'm sure that the next time I drive the 200 miles to Key West to rescue someone's computer network in what the owner described as "Executive Level Service", the bike will be there. I hope so. Quirky is good. Hopefully whoever owns that place won't "clean it up" too much. Part of the charm of Old Town Key West is the wonderfully scruffy look that the place can have. Duval Street looks like Disney partnered with TGI Fridays and what was born was the result. Leave the tourist traps behind and the crowds thin out rapidly and you get to see the charm that was everywhere and is slowly being gentrified away. You may even see a bike growing on a balcony.